From Goodreads: In the tradition of Jonathan Strange & Mr. Norrell, this brilliant first novel fuses history, fantasy, and romance. Prepare to be enchanted by M. K. Hobson’s captivating take on the Wild, Wild West. The year is 1876. In the small Sierra Nevada settlement of Lost Pine, the town witch, Emily Edwards, is being run out of business by an influx of mail-order patent magics. Attempting to solve her problem with a love spell, Emily only makes things worse. But before she can undo the damage, an enchanted artifact falls into her possession—and suddenly Emily must flee for her life, pursued by evil warlocks who want the object for themselves. Dreadnought Stanton, a warlock from New York City whose personality is as pompous and abrasive as his name, has been exiled to Lost Pine for mysterious reasons. Now he finds himself involuntarily allied with Emily in a race against time—and across the United States by horse, train, and biomechanical flying machine—in quest of the great Professor Mirabilis, who alone can unlock the secret of the coveted artifact. But along the way, Emily and Stanton will be forced to contend with the most powerful and unpredictable magic of all—the magic of the human heart. My Reveries and Ramblings: Take an old Western then add some magic, a pinch of paranormal, and a sprinkle of romance and you get The Native Star. This was one crazy steampunk adventure. The Native Star follows a 25 year old witch, Emily. She and her adoptive father, Pap, own a magic shop-mostly for home use; however, it is being run out of business by a larger company. In an effort to ease Pap’s life, she casts a love spell on her friend for money hoping that after they get married she will grow to love him. However, her spell goes wrong and a poor drunk warlock, tells Emily about suspicious events occurring as well as accusing her of using dark magic. After going to check on his suspicions, Emily gets a native star stuck in her hand. With the help of Dreadnought Stanton, the most aggravating Warlock ever, she goes in search of removing it. Their journey across America is filled with problems. Almost every magical society is after them, including the government. Apparently the native star is much more valuable and deadly then Emily originally thought. What an adventure! I felt like I was there. When Emily and Stanton were tired, I was tired. When they were scared, I was scared. It was so much fun. This novel takes place in 1876. Their journey takes them from California all the way to the east coast. It is an America where magic is used everywhere, even in the government. This magic is powered through faith and belief in it. You do get the occasional anti-magic religious town. This world is filled with secret societies, radicals, zombies, and flying machines. The story has an old western feel to it-so much so that I visualized some of it in sepia. No joke, it was almost like watching a blockbuster western film. Epic. The characters were so well-written (the whole book was!) At the beginning of the novel, Emily made a choice. It was the wrong one and everything that happens to her after that is the consequence of one small decision. Hobson explores choices and their consequences throughout The Native Star, for almost every character. Emily is a very human character. She makes mistakes and she is not perfect in any way. But she tries to do the right thing. Emily gets stuck with the “insufferable” Stanton, who has made it his life mission to show off his magical knowledge. Stanton was a fascinating character. At the beginning, I agreed with Emily on his annoying and supercilious attitude and comments. I remember thinking “It’s going to be a long ride.” But over the course of the book, the reasons for his actions and personality are revealed and I (and Emily, of course) started to fall in love with him. The romance wasn’t overpowering though. It started out as hate then turned to love over time-basically a growing attraction. Stanton reminded me of Mr. Rochester from Jane Eyre. He’s definitely the strong smart guy, but there is no doubt that he is tortured. These two are the central characters of the novel. There are a whole bunch of others including an Indian Holy Woman, an evil soul that possesses people, a radical warlock who happens to run the American military, and a paranoid feminist witch. This is the first book in a series. 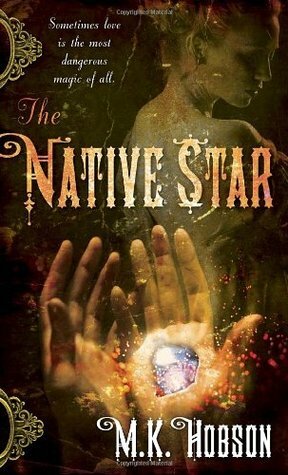 The Native Star is an exhilarating adventure that will leave you wanting more. I give it 4/5.